The idea of the SAS Pentathlon originated in the Scottish Highlands. It was brought to Switzerland in 1978 and the first Organizing Committee consisted of Guolf Gattiker and Ivan Wagner. The history of the SAS Pentathlon, traced back all the way to its Greek Olympic origin, is described in the SAS yearbook «Der Schneehase 1975–1980». Since the first Pentathlon in 1978 and until 1994 Pierre Hirschy, former Lieutenant General of the Swiss Army and President of the Swiss Ski Federation, has been in charge of the Patronage of the SAS Pentathlon. In 1998, he was succeeded by Ivan Wagner, the former President of the Organizing Committee. Michael Ambühl was born in 1951 in Bern, where he also grew up. He studied Applied Mathematics and Management Science at the Swiss Federal Institute of Technology, ETH, graduating as a Ph.D. His main areas of academic interest were, and still are, game theory and how people behave and decide in conflict situations. After graduation and some years in the academic field, Dr. Ambühl entered the Swiss diplomatic corps where he climbed the ranks with postings both in the Swiss Capital and at the Swiss Embassies of Kinshasa, New Delhi and EU/Brussels. Michael Ambühl led the Swiss negotiation teams in a series of top level international political negotiations, including being the Swiss chief negotiator in the Bilateral II negotiations with the EU and in Swiss-US negotiations concerning banking. He also participated as mediator in critical international political initiatives such as the relaunch of the dialog between the permanent members of the UN Security Council and Germany (“P5+1”) and Iran in the efforts to restrain proliferation of nuclear technology. Dr. Ambühl became State Secretary in the Ministry of Foreign Affairs and ended his career in the Swiss government as the State Secretary in the Ministry of Finance. Since 2013, Prof. Ambühl is Head of the Chair of Negotiation and Conflict Management at ETH and lectures in this field with his special penchant for a mathematical approach to negotiations. As of January 1, 2018, Michael Ambühl will be Dean of the Technology and Economics Faculty at the ETH. Dominique celebrated her greatest victory in Sotchi, Russia, on February 12, 2014, when she was the fastest athlete down the course and won the downhill Olympic Gold medal. During the same Olympic Winter Games, she finished 5th in the super combination event. Further great athletic achievements include two top 5 positions in World Championships and 49 top 10 ranks in FIS World Cup races, 3 of them at the very top of the podium as number one. As a sign of her great achievements, Dominique was named female athlete of the year in Switzerland in 2014. In 2015, after 8 years in the Swiss National Ski-team, Dominique decided to step back from competing at the highest levels to focus her energy on her academic education aiming at achieving her M.Sc. in physics.Next to her academic studies, Dominique studies and trains to extend her general aviation license to the commercial pilot license and she has co-authored the book Making it Happen, building on her experiences of highs and lows during her time as an elite athlete. In what’s left of her leisure time, she is still a passionate skier, and an accomplished golfer with a 10.7 handicap. Urs Schaeppi is the CEO of Swisscom AG, a Swiss blue chip ICT company. Under Urs’ leadership, Swisscom has strengthened its position in a highly competitive market. Swisscom focuses on building the best infrastructure, creating the best experiences for the customers and realizing the best growth opportunities. The company will continue to be challenged by global technology giants like Amazon, Google, Microsoft and Apple – all charging for their share of the ICT market. Urs is also a member of the SAS! Next to his challenging positions in the senior management of Swisscom, Urs was the President of the Central Committee of the SAS from 2010 to 2013. Spending his childhood and youth in Mürren, Urs started skiing very early and became a very accomplished alpine skier, competing in FIS races and racing for the Swiss University Ski Team at the Universiade during his studies at the ETH in Zurich. He has retained his passion for skiing and the mountains and has also conquered the Patrouille des Glaciers in later years. Karl Frehsner has been awarded as the most successful alpine coach of all times. Austrian of origin, he has put his mark on the Swiss ski sports for decades. For 17 years, Karl was head coach for the Swiss men alpine team. During these «golden years» of Swiss alpine skiing, the Swiss team, comprising stars such as Pirmin Zurbriggen, Peter Müller and Franz Heinzer, won 35 world championship- and Olympic medals. The peak was the «gold rush» of Crans Montana in 1987, where the Swiss women won all the five gold medals and the men won 3 out of five, together with silver and bronze in the downhill race. After these successful years in the Swiss alpine skiing team, Karl moved to the Sauber Formula 1 team, and then back to alpine skiing as head coach for the Austrian women’s team. In this capacity, he added another 18 large championship medals, coaching the Austrians Renate Götschl and Alexandra Meissnitzer to their great achievements. In 2002, Karl returned to the Swiss women’s alpine team and in 2008 he took on the coaching and support of our own Tamara Wolf in her come-back efforts after her injuries. Beat Hodler is inseparably connected to the history of modern skiing. Not only was he born into a skiing family, Beat’s father Marc Hodler was the FIS president for 49 years, Beat has also wed skiing tradition, being married to Chloé Hodler-Varley, a British alpine skier who participated in the Grenoble Olympic Winter Games in 1968. This “anglo-swiss” connection led to close ties not only to the SAS but also to the Kandahar Ski Club. Only recently Beat handed over his office as the first non-British President of this historic and traditionally rich Club founded by Arnold Lunn in 1924. Beat started skiing in Murren, where his family has a vacation home and where his father knit close ties to one of the founding fathers of the SAS, the late honorary SAS member Walter Amstutz. Since his youth, Beat maintains close ties to Mr. Amstutz’s nephew, Max. The two are frequently asked to hold presentations and speeches about the early history of alpine skiing. Next to his great enthusiasm for skiing, Beat is an enthusiastic golfer with several participations in the Swiss national junior team and many years as President of the Golf & Country Club Blumisberg in Bern. In his professional life, Beat is an accomplished law practitioner focusing on, to no surprise, sports law and nutrition. Kjetil André is the most winning alpine skiing athletes of all times. Over the course of his skiing career, spanning almost 20 years from 1988 to 2006, Kjetil André won four Olympic gold medals and five World Championships. All in all, he has 20 Olympic- and World Championship medals from all four alpine skiing disciplines. Kjetil André won 21 world cup victories and the overall FIS world cup in 1994. His career appeared to be over when he sustained a serious ankle injury in 2003, forcing him to miss the 2003/04 season. But Kjetil André made a great comeback the following year and concluded his career with victory in the Super G race in the 2006 Olympic Games. All his merits and achievements qualify Kjetil André Aamodt as one of the most decorated and accomplished winter athletes ever! These days, Kjetil André is making himself useful to the FIS and to the continued development of the sports of alpine skiing. He has been the athletes’ representative on the FIS commission and was elected to the FIS executive board in October 2012. He is also busy with his own businesses. 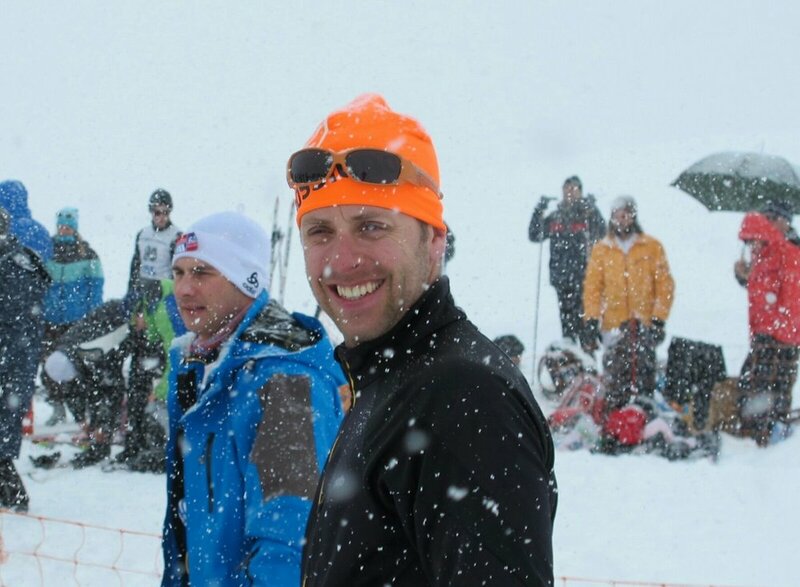 He has recently set up a race academy to teach young athletes slalom and giant slalom racing. He is a sought after business speaker, leveraging his experience from tough competitions to motivate and help business leaders reach their full potential and improve their achievements. Further to that, Kjetil André supports Norwegian television as an expert commentator throughout the winter’s alpine skiing races and he lends his name to the UNICEF as an athlete ambassador for this organization. Manuela was born 1978, the same year as the inaugural SAS International Pentathlon took place. Manuela is one of the world’s most successful snowboard athletes. She was born and grew up very close to the slopes of the well-known ski resort Lenzerheide and made her first attempts on the snowboard as a thirteen year old girl. Three years later, she came in second in the junior world championship, which prompted her to go for a professional snowboarding career. At the end of her first year as professional, she won the Swiss Halfpipe championship, before her international career really took off: Runner-up in the world championships in Whistler Mountain in 2005 and seventh in the Olympics in Turin the following year. Her biggest single achievement was her victory world champion title in Half-pipe on home turf in Arosa in 2007. In addition, Manuela won the overall world cup in the Half-pipe four times. Manuela withdrew from her career at the end of the 2008 season, but chose to return in the fall of 2009 to participate in the 2010 Olympics in Vancouver. She qualified for the event and made a good run for the final, but unfortunately crashed. Following the definitive end of her athletic career, Manuela now devotes her talent and energy as an ambassador for the good of children and nature. In the summer of 2010, she completed her education in Sales and Marketing and she also acts as a promoter for various sports brands. Urs is an SAS member, an alpine skiing world champion and currently the President of the Swiss Ski Federation; Swiss-Ski. Despite his young age, Urs has a number of great achievements in many aspects of life to look back at. Starting with his junior world champion title in 1987, he crowned his career as a world class alpine skier with his downhill world champion victory in 1993. By 1997, his skiing career ended by injuries, Urs had achieved a number top 10 results in the FIS world cup. However, Urs did not rest before he pursued his academic ambitions, completing the BA studies in Business Administration in 1999, obtaining his master degree in St. Gall in 2001, and achieving the doctor title in 2009, in parallel to his professional career. This career has been as steep uphill as the slopes he once raced downhill: CFO in a mid-size international logistic firm three years after his master degree and since 2009 CEO in well-known Similasan, a Swiss pharmaceutical with 130 employees worldwide. Matthias is a SAS member and the Director for the Department of Sports (BASPO) and the top government official for sports in Switzerland, reporting directly to the minister of Defense and Sports. Keeping the positive effects of Sports and Motion as its guiding principle, the BASPO builds the best possible conditions for the people in Switzerland to exercise sports and bodily activities. Further, the BASPO supports all aspects of official sports in Switzerland, from the lowest league junior football club all the way to the top level athletes and contributes wherever possible to their success. In addition, the BASPO is responsible for building the necessary academic knowledge and to educate trainers and leaders engaged in all levels of Swiss sports. The BASPO runs two sports and athletics centers in Switzerland; one in Magglingen and one in Tenero. These are Matthias’ day-to-day responsibilities. Lately, he has been focusing on the revision and parliamentary consultation process of the Swiss Sports legislation. This law governs the exercise of sports in Switzerland and sets the parameters for the future of Swiss sports activities. Matthias will certainly tell us more about his mandate and main priorities during our weekend in Grindelwald! Next to his studies and impressive professional career, Matthias has found the time to win merits as an active athlete, first and foremost as a cross country skier.In this discipline, Matthias has won the Björnstad Run, he has finished 12th in the Engadine Ski-Marathon, been part of the SAS relay-team winning the bronze medal at the Swiss cross country championship and finished third in the 1991 FIS Universiade – amongst many other victories he barely remembers! Founded in 1924 the SAS now has 1200 members in 7 sections (Basel, Bern, Fribourg, Geneva, Lausanne, Zurich, Norge). A regional association of Swiss Ski. Offers alpine skiing, cross country skiing and alpinism. Manages the Swiss Student National Teams, Alpine and Nordic. Organizes, on behalf of the Swiss Federation of University Sports, the University Skiweek which includes the SWUG and the Championships of the Swiss Federation of University Sports, both Alpine and Nordic. Offers an own race-series with the SAS Cups. Offers individual solutions for students engaging in top-level sports during their studies. Emphasizes on the incomparable SAS Spirit, social life and friendship. For more information visit www.sas-ski.ch.